Express Post Request Example Tutorial is today’s leading topic. When we use Node.js as a platform, then we almost use expressjs as our web framework. So when we are building applications using ExpressJS, we will need to get information from our users. In the HTTP sense, we have two main ways to collect the data from the user via browser and that is GET and POST. In this example, we use the POST method to obtain the information from the User. So when a user sends a request from the client, we receive the request and extract the data from the request and save the data into the database. 3 #2: Connect Express app to MongoDB database. 4 #3: Install body-parser module. 5 #4: Create a Mongoose Model. 6 #5: Create Express routes for the application. 7 #6: Send A Post Request From POSTMAN. We start our demo by installing expressjs. But before that let us create a project folder by the following command. Open the project inside VSCode. Initialize the package.json file using the following command. You can install express using NPM or Yarn. It does not matter here. Also, install nodemon server as a development dependency. Now, create the HTTP server. Inside the root folder, create one file called server.js and add the following code inside it. 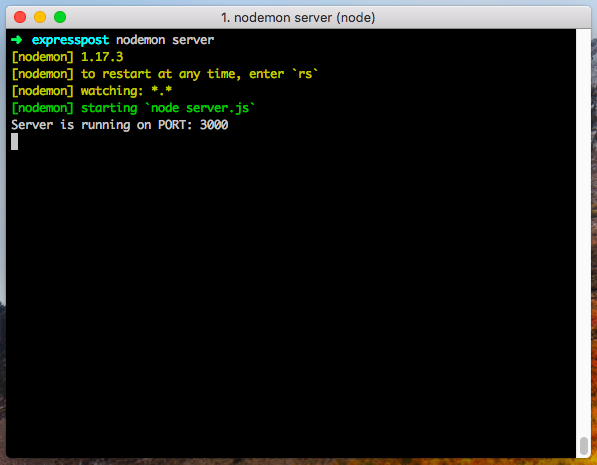 Go to the terminal and hit the following command to start the nodemon server. #2: Connect Express app to MongoDB database. First, start the MongoDB server using the following command. Please install the MongoDB, if you have not installed previously. Now, inside the root of the project folder, create one file called db.js and add the following code in it. Okay, now install the Mongoose library using the following command. Here, we have connected our node express app to the MongoDB database. We need to install body-parser module because to handle the HTTP POST request in Express.js version 4 and above; you need to install middleware module called body-parser. The body-parser extract the entire body portion of an incoming request stream and exposes it on req.body. The body-parser parses the HTTP request body. It usually is necessary when you need to know more than just the URL you send to the server, particular in the context of a POST or PUT or PATCH HTTP request where the information you want is contained in the body. Primarily it is a middleware for parsing the JSON data, plain text as you require. After adding the body-parser, our server.js file looks like this. #4: Create a Mongoose Model. Inside the root, create one file called User.js and add the following schema in it. So, here we have defined our schema for the users’ collection. It contains two fields. #5: Create Express routes for the application. Inside the root folder, create one file called UserRoute.js and add the following code. Here, we have used the POST request to store the data inside MongoDB database. We have already installed and configured the body-parser middleware, so we can extract the data that can be used and save into the database. Now, import this file inside the server.js. #6: Send A Post Request From POSTMAN. Okay, now we need to send a request to a Node server. Make sure you have running the Node.js server. If not then you can start it by the following command. Now, if you send an express post request to the server, then it returns the following json. Remember, you need to add form data which is name and email. Here, you need to select the x-www-form-urlencoded so that you can get the data into the req.body. Now, check the MongoDB database. So, here, we have successfully saved the data using express post request example. We can see the request by logging in the console. Just put the console.log statement inside the UserRoute.js file. Finally, Express Post Request Example is over. Thanks for taking. thanks for this. How do you send a POST request from an HTML form?